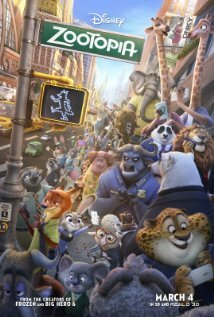 2) Artwork/Animation - Total Thumbs Up: Walt Disney Animation Studios did a marvellous job with the film. The textures were amazing. The wool of Bellwether's hair, the fluffy bunny fur, the thicker fox hair, you could tell at a glance how they would feel and which would be softer or bouncier than another. As the credits and the film itself will show, they spent a ton of time on research for the plethora of animals represented in the film. The attention to detail was riveting. 3) Plot/Story - Total Thumbs Up: Though there is a lot to keep the younger kiddos entertained, this particular film's plot was geared more for the tweens and adults. Lots of delicious layers and themes were explored. Following your dreams, being held back, dreams destroyed and dreams found. Prejudice (from both sides of the predator and non-predator sides), assumptions, the fact actions have consequences - even when you're not aware of it, forgiveness, understanding, and the fact everyone has a part to play no matter their size or origins. 4) Music - Total Thumbs Up: Not only is there a totally addicting song from Shakira, but there are several old favorites brought up for the soundtrack as well. Best of all are the BGM/OST tracks by Michael Giacchino as he gives each zone and the story itself some lovely, unique music.